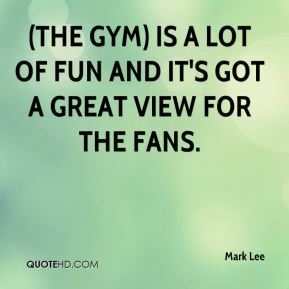 (The gym) is a lot of fun and it's got a great view for the fans. 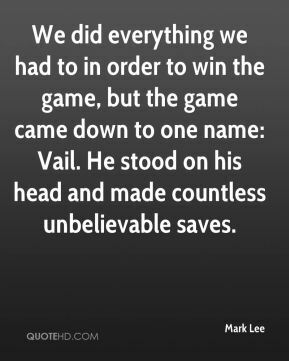 We did everything we had to in order to win the game, but the game came down to one name: Vail. He stood on his head and made countless unbelievable saves. We got exactly what we thought we'd get from them. They over-packed the paint. We knew we'd have trouble with their penetration and we did. ... I think the biggest change was defensively. We took away their ability to penetrate. 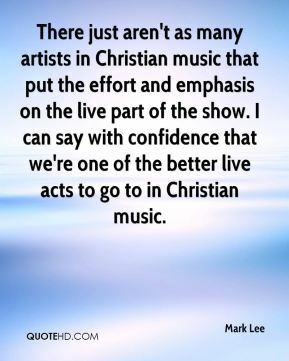 There just aren't as many artists in Christian music that put the effort and emphasis on the live part of the show. I can say with confidence that we're one of the better live acts to go to in Christian music. 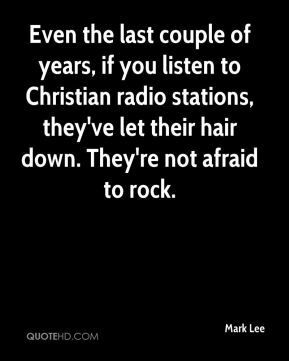 Even the last couple of years, if you listen to Christian radio stations, they've let their hair down. They're not afraid to rock. 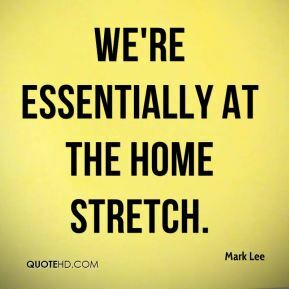 We're essentially at the home stretch. They're just a very good team. 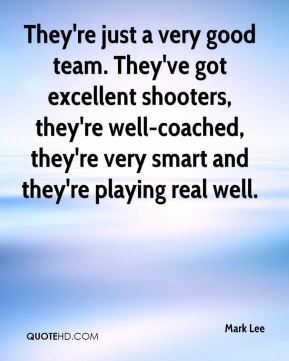 They've got excellent shooters, they're well-coached, they're very smart and they're playing real well. 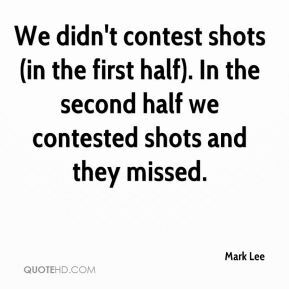 We didn't contest shots (in the first half). In the second half we contested shots and they missed. 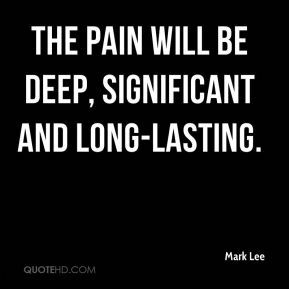 The pain will be deep, significant and long-lasting. 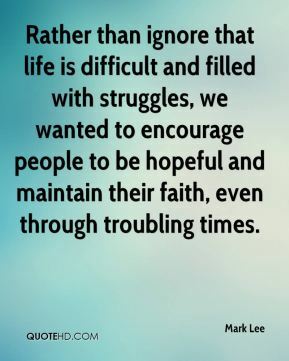 Stakeholder engagement has been floating around like the spice of good cooking from next door, and the sense has been that if we all could share some of that spice, everything would be better. 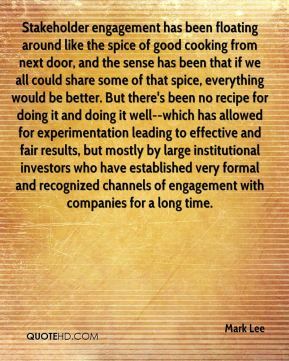 But there's been no recipe for doing it and doing it well--which has allowed for experimentation leading to effective and fair results, but mostly by large institutional investors who have established very formal and recognized channels of engagement with companies for a long time. 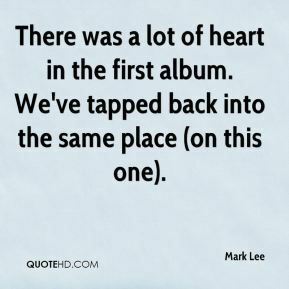 There was a lot of heart in the first album. We've tapped back into the same place (on this one). Tonight we responded and came back against the loudest crowd we've played against all year. 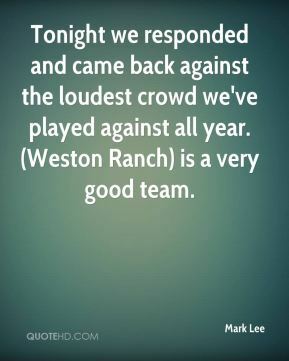 (Weston Ranch) is a very good team. If the right thing came along I'd be interested (in acting). But directing is what I'm enjoying now, I really love it. I haven't been this happy in an occupation in my life. We're playing our best hockey right now. The team has matured in the last part of the season. It's a pleasure to see how they've improved.